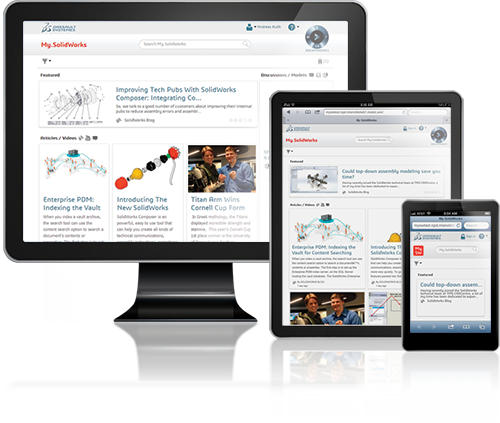 Your one place for all things SOLIDWORKS. Get answers. Learn More. Connect with Manufacturers. MySolidWorks helps you be more productive by connecting you with relevant SOLIDWORKS content and services—anytime, anywhere, and on any device. With MySolidWorks, you can get answers about SOLIDWORKS, learn more, and connect with manufacturers. You can easily search across the SOLIDWORKS community and all support resources to get answers to your questions fast. Explore over 700 SOLIDWORKS online product tutorials in a wide range of topics and releases, and evaluate SOLIDWORKS products with MySolidWorks Online Product Trials from any tablet, PC, or Mac. MySolidWorks Standard provides over 600 introductory SOLIDWORKS training videos, online storage services for sharing designs, and a worldwide network of manufacturers who can help bring your designs to life. MySolidWorks Standard is available to SOLIDWORKS Subscription Services users to help design teams gain skills to work faster and smarter with SOLIDWORKS. MySolidWorks Drive connects cloud-based file storage services, such as Dropbox and Google Drive, with MySolidWorks. MySolidWorks Drive enables SOLIDWORKS users to view their designs online with the eDrawings online viewer and easily share large design files from anywhere with manufacturers, colleagues, and vendors. MySolidWorks Professional provides access to SOLIDWORKS certification preparation courses, extended online training with over 1000 training videos. This offer is available for customers with SOLIDWORKS Subscription Services who want to provide their design team with the most efficient and effective work environment. MySolidWorks Manufacturing Network lets SOLIDWORKS users bring their designs to life by easily finding and connecting with reliable manufacturers offering 3D printing, sheet metal, CNC machining, and injection molding services. It allows users to get physical parts made fast, while manufacturers are able to reach SOLIDWORKS users more directly to promote their services and respond to RFQs.